Texicans are generally ornery folks, and they are especially possessive about their history. Icons of our heritage include ‘Country and Western’ music, longhorn cattle, and the famous Yellow Rose of Texas. This card series weaves a theme about the Fagan family, who came to Texas from Ireland in 1826 to settle along the San Antonio River near the Gulf Coast. Drawing of the “flower loose four” brand, registered to Peter Henry Fagan in 1875. 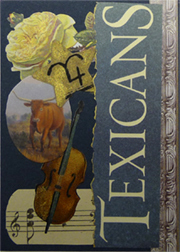 Title image snipped from the book jacket of The Texicans by Nina Vida.